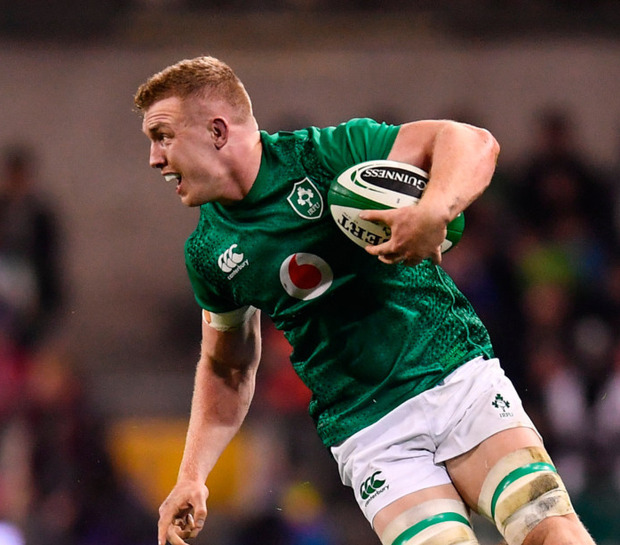 The openside jersey is up for grabs after Josh van der Flier was ruled out of the Six Nations finale in Cardiff with a groin injury, opening the door for a return for his Leinster colleague. After his starring role in Ireland's Grand Slam last season, the 24-year-old has endured an injury-hit year. His sole appearance in green saw him come off the bench against Argentina and he was named to start against New Zealand a week later but was withdrawn on the eve of the game. He has not played at all since damaging his calf in Leinster's pre-Christmas fixture against Connacht on December 22, but appears to have recovered just in time to face the Welsh. Leavy is up against Seán O'Brien and Jordi Murphy for the No 7 jersey, while Joe Schmidt also has the option of starting with the back-row that finished against France with CJ Stander at blindside, Peter O'Mahony at openside and Jack Conan at No 8. "He's mobile, he's physical at the ball, he's a bit of a pest when he plays, you know?" scrum coach Greg Feek said. "There are other aspects, each guy has his strengths and with Dan he certainly does have them and I feel for him a bit, he's been frustrated getting over a little niggle and sometimes getting that right is his priority. "He's got some X-factor there that would be handy to have." After missing the win over France, Rob Kearney and Joey Carbery will also have to prove their fitness in training this week. Kearney appears the more likely of the pair to make it, but Carbery is fit enough to allow Ross Byrne to return to Leinster. Although a six-day turnaround from France to Wales may encourage him to change things up, Schmidt is not expected to make wholesale alterations after withdrawing a host of frontliners early in the second-half due to the comfortable scoreline. “We want to keep on getting better and playing to that level as often as we can,” Conor Murray said of the performance against France. Both teams will be named tomorrow and Wales are hopeful of having Liam Williams available for their Grand Slam bid. The full-back has not taken contact in training this week, but assistant coach Robin McBryde is upbeat about his chances. And the former prop reckons the reigning champions will be back to their best at the Millennium Stadium. “Ireland had a good run-out against France. France weren’t at their best but Ireland went about their business,” he said. “I think Ireland were a bit shocked by the physicality of England in that first game. “We are facing arguably the best side in world rugby at the weekend. It’s a chance of a lifetime for these boys. They are definitely the team to beat. These matches are decided on fine margins.